After years in the car wash industry many operators can get complacent. They stop innovating and their business fades into obscurity. That is not Clay Perkins’ way. Seventeen years after opening his first wash the veteran car wash owner continues to evolve his business. 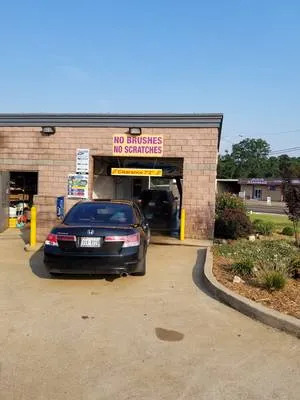 He has introduced new equipment and services designed to reconnect with his current customer base and draw in new car washers to his rural Texas wash. 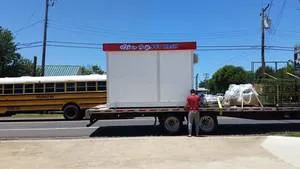 The new dog wash delivered ready to install. Perkins operated the two locations by himself for over a decade. The original Touch Free wash in Hallsville, TX featured a touchless wash and an ice machine. Perkins second location in Pine Tree, TX had both a touchless in-bay unit and four self-serve wand bays and was the busier of the two locations. As any single-operator, self-serve owner can attest running a self-serve business is a lot of work. Although many get into the business dreaming of operating the wash from afar and simply emptying out the coffers every evening, they quickly learn that to successfully run a self-serve location you need to be hands on. No dryer needed, spot free water does the trick. Committing the time needed to run two sites by himself and finding time to spend with his family proved to be extremely difficult, prompting Perkins to sell off the busier of his two sites and focus his attention on growing his single location. While downsizing his wash holdings certainly had its benefits for Perkins’ family life, it has one major drawback — it downsized his revenue as well. 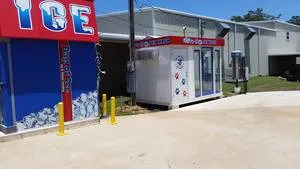 To help regain some of the lost income from the sale of his Pine Tree location Perkins has invested heavily in his Hallsville site, putting in a new state-of-the-art in-bay automatic and a dog wash unit. 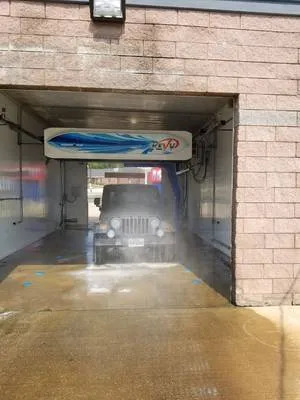 When Perkins and his former partner built Hallsville Touch Free Carwash 17 years ago, they opted for a PDQ Lazerwash unit. 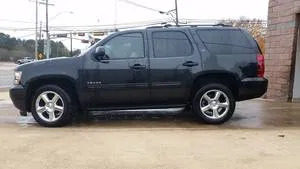 Although located in sparsely populated eastern Texas with plenty of dirty, dusty roads, Perkins chose a touch free unit to clean vehicles without the risk of scratching or damaging heavily soiled cars. “We have a lot of mud and dirt in our area,” Perkin says. “So I try to tout the no brushes, no scratches aspect of the wash. The equipment does a good job cleaning cars. Touch Free operated its original PDQ unit until just recently when Perkin decided it was time to make an upgrade. The old machine was still turning out clean and shiny cars, but continuous maintenance and rusting components announced that Father Time had taken its toll on the old workhorse. Soaping up man’s best friend. Further intensifying the need to upgrade the in-bay unit was the arrival of a friction wash just down the street that was threatening to carve a piece out of an already small pie. While two washes in a trade area many would theorize could not support one might drive a less determined operator to throw up his hands and close up shop, Perkins embraced the challenge. His newly installed Washworld unit has not only allowed for trouble-free operation, it has helped drive Touch Free’s car counts beyond pre-competition levels. In fact, the new unit has produced a 30 percent jump in traffic over the long-standing location’s established numbers. Quick four minute cycle times mean there is rarely a wait. The touch free unit in action. Hallsville residents love to take their dogs with them to the lake in the summer and out in the field in the fall during hunting season. After a day of splashing at the lake or tracking game man’s best friend needs a bath before returning home and Perkins’ Clean Pup Pet Wash offers a quick, easy, and affordable option to home washing or expensive groomer fees. Perkins opened Clean Pup in June of this year to an overwhelmingly positive response from the community. The site is averaging four to five dog washes a day and has cleaned as many as 15 dogs in a day. The service costs $10 for 12 minutes of wash time, with additional time available for a few dollars more, although it is rarely needed. 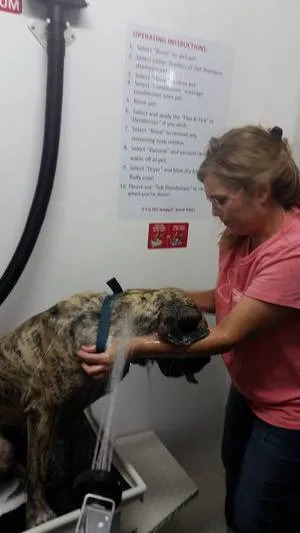 The average dog wash is trending around eight minutes giving the dog owner plenty of time to rinse down the washtub and floor, sanitizing it for the next customer. In addition to the disinfectant spray, the vending dial features tearless shampoo, oatmeal shampoo, flea and tick shampoo, conditioner, deodorizers, rinse, dryer, and vacuum settings. Many operators might have buried their heads in the sand if a new operator moved into their small market and threatened to take a major portion of their revenue. Perkins however responded with a major equipment investment to transform his location and drive revenue to new heights in the face of increased competition.